There may be nothing more sacred than the safety and security of your home and family so, of course, you would go to any lengths to protect them. You can install systems to safeguard against events like home intrusion and fire but there is no way to prevent that unthinkable disaster. However, you can guarantee that you and your family will be prepared by creating a home emergency plan. 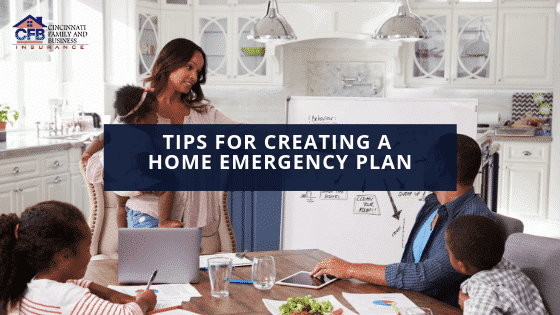 This type of plan should be designed for all emergency situations so here are some tips to ensure that your plan is complete. Any property loss can be devastating but you will suffer less anxiety if you know that you are financially protected. The first step is to review your policies to be sure that they will cover any natural disasters that may be prevalent based on the area in which you live. Then, determine that your deductibles are within your budget and that the policy will pay the replacement costs of your property and possessions. Make whatever adjustments wherever necessary. There is usually panic and chaos in a major emergency so to ensure that everyone has the best possible chance for escape, you need a step by step plan. The plan must include the locations of escape routes from each room in your home, assignment of specific duties to all who can handle them, and accommodations for those like infants, senior citizens and pets who cannot escape independently. There should be a step included for someone to contact emergency personnel if there is no home security system or if it malfunctions. You must identify safe meeting spaces within the house in case of an earthquake or tornado and outside of the house in case of fire or flood. Emergencies often occur with little warning so you need to decide how you will respond if all family members are not together during the event. You should check with schools and other organizations to determine how they will protect your children. You should also teach your children how to contact you if necessary. Your local fire and police departments can make recommendations to help you with this part of the plan. In cases where there is the potential for devastation to entire communities, it may be necessary to evacuate the area. You should decide on the location of your temporary shelter and multiple routes to use to travel there. It is important to inform friends and family members of your evacuation plans when possible so that they can track your progress. One of the first steps in your home emergency plan is to pack a bag. This bag should be on hand in a designated area of your home and should contain all the items you need to sustain all members of the family for at least 72 hours. The bare essentials are water, a whistle, a first aid kit, a non-battery-operated flashlight, a portable device charger and a battery-operated radio. Any necessary medications like insulin or inhalers should be added once the evacuation decision is made. Your plan needs to include instructions on how family members will contact each other if separated. In widespread emergencies, cell towers may become inefficient so texting should be the first option. Internet service may also be affected so you should identify wifi hotspots outside of your local area so that you can use email or social media to update loved ones about your situation. A written list of emergency contacts should be carried by all family members so that authorities can notify them if your communication efforts fail. Once you have the plan, practice it, practice it and practice it. Create a variety of possible scenarios and work through each of them. Make adjustments to the plan when necessary. There is nothing like the real thing and it is difficult to know exactly how everyone will respond. Hopefully, a well-organized home emergency plan keeps you and your family safe from all harm.